*This is a common unsafe practice at construction site. "A scaffolding erected at 2 m high which used for block works. What is commonly happening at site is that, an unauthorized worker or personnel will modify the structure of the unattended scaffold (e.g removing the brace of the scaffold structure and use it on another purpose or any other reasons on it). Apparently, the scaffold will now be "unsafe" to use and the risk will be high that can lead to serious injury whoever will work on the modified scaffolding structure." A scaffolding erected at 2 m high used for block works collapsed and two masons suffered minor injuries. Upon investigation, it was revealed that the cause of the collapse was unauthorized modification of scaffolding structures. Two masons (uncompetent scaffolders) who are working on the area remove the cross bracings of the scaffolding because it was obstructing their path for shifting the concrete blocks manually without informing to anybody. Apparently, this made the scaffolding structure unsafe and unstable and possibility to collapse which actually happens. 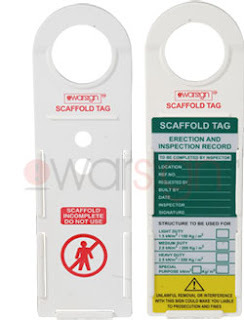 Certified/Competent Scaffolders must be deployed on site for erection, dismantling and modification of scaffold. Unauthorized scaffold modification should not be allowed. Proper supervision on part of the Foreman or Engineer. Work to be carried out under competent supervision. Safe work plan must be prepared and communicated to all concerned. Emergency response procedures must be available and followed. "Communicate site rules regarding scaffolds during site inductions and refresher awareness through tool box talks. Supervision required by management, appoint responsibilities to foreman and supervisors. Workers should be informed during tool box talks about the effects of unlawfully altered scaffolds. Ensure proper bracing, mid-rails and toe boards. The scaffold tag must be near a safe and secured access point".